Here are some BASIC and FUNDAMENTAL Concepts of Marketing. The super basic definition- Managing profitable customer relations. These people share a need or want that can be satisfied through exchange relationships. A company’s value proposition is the set of benefits or values it promises to deliver to customers to satisfy their needs. This is also referred to as a USP- unique selling proposition. This forms the core of your marketing message. Sometimes you can encapsulate your usp into your businesses tagline. This should also be what is conveyed by the headline you use on your web site or in any ad campaigns. * Notice that the first 4 steps are all about value for the customer. I will write future posts going into more detail about many of the above elements. A funny video about SEO, blogging, marketing, tweeting, etc… Creative delivery. Sometimes a book jumps off my bookshelf and says look at me again- Now! Being that I am currently studying marketing, when I picked up the book ‘The Rise of the Creative Class’ By, Richard Florida again, I had a whole new appreciation for its contents. 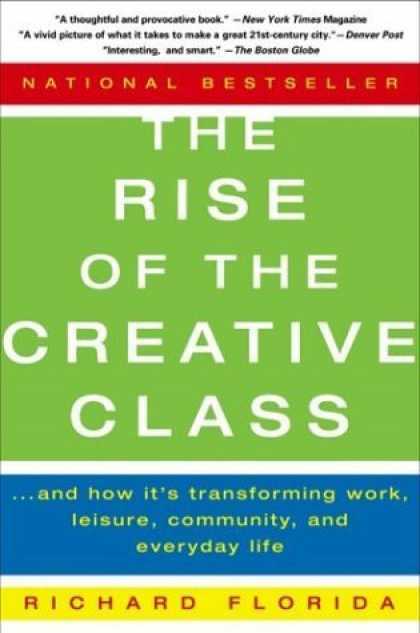 This national bestseller written by a professor of economic development, makes many key contributions to the discussion about the central role of creativity in the economy, and specifically highlighting a growing class of society he calls the creative class. 1.) Investing in Creativity to ensure long-run economic growth. 2.) Overcoming the class divides that weaken our social fabric & threaten economic well-being. 3.) To build new forms of social cohesion in a world defined by by increasing diversity and beset by growing fragmentation. This book shows how codependent and increasingly connected are the worlds of finance/business/economy and the worlds of the arts/creativity/culture. It also really broadens the scope of what we may usually categorize as “creative work” and illuminates the integral role that creativity has in many of the jobs central to our economic health.